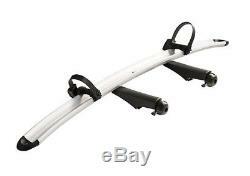 Thule 929 G6 Euroclassic 3 Bike Carrier. & 9081 4th Bike Adaptor. Thule 929 4 Bike Cycle Carrier Fitting Instructions. Fits cars with exterior spare tyre. Fits most bikes with disc brakes. Maximum weight per bike is 25 kg. This package Includes 9081 4th bike adaptor 15 kg for Adapter 9081. Thule 929 G6 Euroclassic Easy to Use, Extendable, Tilts, Locks, Robust and Premium. Fits 2 bolt flange, swan neck and detachable towballs. Exclusive LED taillights together with timeless design give the carrier an exceptional appearance and high visibility. Aluminum and other high-tensile, lightweight materials have been used for this premium cycle carrier. The simple one-hand-coupling requires very low closing force, is still giving the highest stability and safety possible and attaches to the towbar within seconds. Folds flat for easy storage, compact enough to be kept in the boot of the car. Foot-pedal-tilt for easy and convenient boot access while the carrier and bikes are mounted. A built-in stop prevents the bikes from touching the ground. The wide tilt-angle enables opening of even very large rear-doors without interfering with the carrier e. This makes loading of bikes faster and much more convenient. Holders have rubber surface for protecting the bike frames. Fits all bikes and wheel sizes kids to adults bike frame diameter 20 to 80mm. The maximum weight per bike is as high as 25 kg, enabling transport of Electric Bikes. Smart and innovative pump buckles for wheel straps for most comfortable and secure fastening of your bike wheels with durable wheel straps. Wide wheel trays with increased distance enable transport of sturdy bikes with large wheelbases. Simply roll the bike in place into the carrier by using the Thule Loading ramp 9151. Thule 929 Dual locking - Locks all bikes to cycle carrier, Locks 929 carrier to car with Thule one key system. TUV euro/be approved safety tested and approved, Fulfils city crash norms. The load capacity of the Thule 929 bike carrier can be increased to 4 bikes, by adding Thule 9 0 81 addational bike adaptor makes the Thule 929 a 4 bike carrier. Thule 9042 4x4 rear door offset adaptor to miss your spare wheel. Thule Supply with euro 13pin electric towing plug most UK towing electrics are 7pin. You will need the Thule 9906 7pin adaptor to convert from Thule European 13 pin to UK 7 pin. 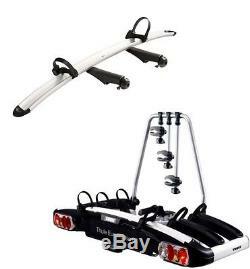 The item "Thule 929 4 Bike Cycle Carrier G6 EuroClassic with 9281 4th Bike Adapter Package" is in sale since Friday, June 07, 2013. This item is in the category "Sporting Goods\Cycling\Car Racks". The seller is "ggcycledeals" and is located in Leicester. This item can be shipped to United Kingdom.